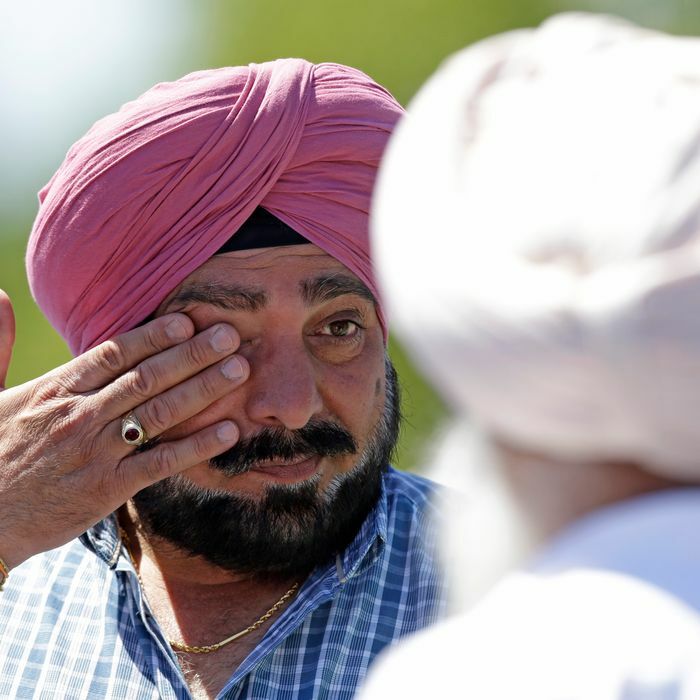 A man wipes away tears outside the Sikh Temple in Oak Creek, Wis. where a shooting took place on Sunday, Aug 5, 2012. It’s a saddening fact that this move is not necessarily overly cautious. Over the past decade, American Sikhs have been constant targets of xenophobic crime, from harassment to murder — taunts, keyed cars, spray-painted homes, vandalized temples, violent pulls on dastar turbans, beatings, bullied children, firebombings, and bullets. The individual assaults rarely constitute national news, but the pattern’s alarming. The Sikh Coalition, a group founded after the World Trade Center attacks, has reported more than 700 incidents in the U.S. since September 11, 2001. Last year, before the tenth anniversary of those attacks, I spoke with Coalition co-founder Amardeep Singh. Just hours after the towers fell, Sikhs in New York were harassed, chased, assaulted, shot with paintballs, and beaten with bats. “Every Sikh knows that when there’s an issue involving violence in the Middle East, or terrorism — going back to the Iran hostage crisis — there’s been an effect on Sikhs, the day of,” Singh said. “The first thing my mother said to me was, ‘Is your bandanna in the car?’ And we began a discussion about whether I should be keeping my turban on. We knew what was coming, and it came.” That weekend, Balbir Singh Sodhi, an Arizona Sikh, was gunned down while planting flowers outside his business. Soon after, a family in San Mateo, California, had a firebomb tossed through their front window, striking their 3-year-old daughter in the head. (It failed to ignite.) The attacks have continued. Last spring, two older Sikh men were shot while walking around Elk Grove, California. One of the standard lines about this violence is that it’s “misdirected,” a case of “mistaken identity” — that these are hate crimes against Muslims, complete with anti-Islamic rhetoric and slurs, that have been pointed, through sheer ignorance, at turban-wearing Sikhs. (In fact, one of the Coalition’s current initiatives is revising the FBI’s hate-crime reporting system, which files attacks on Sikhs among anti-Muslim crimes.) Hence, perhaps, the way Sunday’s CNN coverage of the shooting filled the long gaps between fresh news by circling the same two themes: the platitude that “we don’t yet know” why this happened, and the oft-repeated fact that Sikhs are not Muslims, Sikhs are not Muslims, and, breaking news, Sikhs are still not Muslims. The distinction surely puts some Americans more at ease with Sikhs, but it seems wishful to imagine it offers much protection against violence. The motives of the Wisconsin shooter, Wade Michael Page, are currently being deemed “unclear” — or, I suppose, as unclear as it can get when someone with a vocal history in white supremacy embarks on the mass murder of non-white people. But does anyone imagine neo-Nazi ideology being hostile to Muslims yet studiously undecided on Sikhs? Generally speaking, it’s hard to picture the people who commit such acts being particularly concerned whether their victims are Muslim or Sikh or Hindu or Druze or Zoroastrian or anything else — which is how an Indian Catholic and his friend were attacked in San Francisco days after 9/11. Neither would you imagine the people “successfully” targeting Muslims caring what branch of Islam their victims adhere to. Xenophobic violence doesn’t mesh well with informed, realistic distinctions about the different groups of people in the world. To a certain extent this is its point, and precisely why it terrorizes. It emphasizes that strangers who know absolutely nothing about you, your person, your identity, your culture, or your faith are violently uninterested in knowing more — they’re interested in harming you and making you go away. If you happen to be an American Sikh, this is surely one of the bottom lines of your experience: So long as you and your loved ones are wearing religious garb, you’re marked out for some level of risk — risk of attack, harassment, suspicion, or insult — no matter who others think you are, and maybe especially when they don’t really care.